CARBONDALE, Ill. — Students in the First Scholars program at Southern Illinois University Carbondale recently met their scholarship benefactors when Eric and Deb Suder visited campus. First Scholars is a grant program backed by The Suder Foundation that provides scholarships and a support system for first-generation students. First-generation students are those whose parents (or grandparents, or great-grandparents) do not have college degrees or certificates, and who completed less than two years of school after high school. 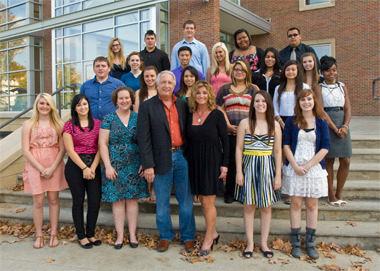 The Suders themselves were on campus recently to meet the students currently enrolled in the First Scholars program. This is the second year for SIU Carbondale students in the program, and the third year the grant has been in place. The first year of the grant was to plan and implement the support system for students. According to The Suder Foundation, first-generation students may face a variety of challenges once they enroll in a university. These challenges can include students having limited access to information about the college experience; a limited knowledge of time management, college finances, budget management, and the bureaucratic operations of higher education; doubts on their academic and motivational abilities, and difficulty balancing family, work and school responsibilities. The program provides much more than financial assistance to students. Program coordinator Christina Gilroy said program goals center on helping students feel connected to the University and to the academic community, while simultaneously encouraging them to develop into community leaders who will “pay it forward.” Students work closely with a peer mentor, participate in community service projects, and join registered student organizations to help them be involved in the college experience. Gilroy said the Suders’ visit was inspiring for the students. The Suders were on campus in late October. Eric Suder has said that SIU Carbondale’s mission and the goals of First Scholars Program mesh well. For more information about the program at SIU Carbondale, visit firstscholars.siu.edu/. To learn more about The Suder Foundation, visit www.firstscholars.org/.